Auld Robin Gray. (Continuation. Second Continuation.). For the past three decades, Anne Lindsay has changed the way Canadians eat, bringing flavour to healthy eating and inspiring a nation with her easy-to-make, delicious food. Now, Anne invites you into her kitchen with "Lighthearted at Home," a collection of her favourite recipes.Anne offers you recipes for every occasion: signature stews and soups, perfectly prepared meat and fish, protein-packed vegetarian entrees, deliciously simple appetizers and much more. 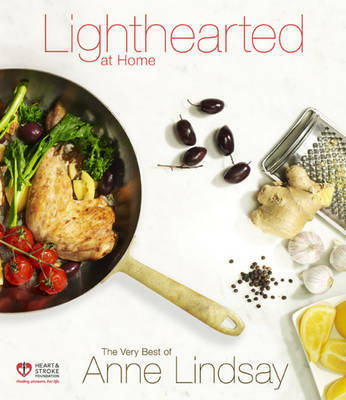 "Lighthearted at Home" includes: More than 500 fully tested recipes, reviewed by the registered dieticians of the Heart and Stroke Foundation, complete with nutritional analysisTips throughout on healthy eating, cooking techniques, make-ahead instructions and ingredient substitutionsCreative ideas for everyday and entertaining menusStunning colour photographyThe Heart and Stroke Foundation, a volunteer-based health charity, leads in eliminating heart disease and stroke and reducing their impact through the advancement of research and its application, the promotion of healthy living, and advocacy. For further information, call toll free, 1-888-HSF-INFO (473-4636). You can also visit their website at heartandstroke.ca.A portion of the proceeds from the sale of this book will go to support the work of the Heart and Stroke Foundation. Anne Lindsay has helped Canadians find healthier ways to enjoy good food for over 25 years. She is the former nutrition editor at "Canadian Living" magazine and has written for numerous publications since the 1970s, including the "Globe and Mail," the "Toronto Star" and "Canadian" "Living." Anne has appeared on many television shows in Canada and the US, and was a regular guest on CBC Newsworld and "CityLine." Today, she continues to promote healthy eating and good cooking. Anne Lindsay was appointed a member of the Order of Canada in 2003. Her five bestselling cookbooks are published in 17 countries, and have sold over 2 million copies.